I will be honest – I wasn’t really thinking the whole thing about wearables is more than a bit overhyped marketing stuff and that I personally would not get much use of it. Sure, you had all these devices that could track your running but I am not a really sporty person nor do I feel the need to tell the whole world where I was while I go running. Which is easy enough, because I don’t. So when I woke op on October 30th with the news the Microsoft Band had launched out of the blue, I was surprised but not really enticed by what I deemed to be ‘yet another fitness device’. My gadget addicted former colleague Jarno Peshier - who had read up on the specs - contacted me that morning, writing “I want one. You will be in the USA soon (for the MVP Summit). Let’s order two, you take them home, and split the next day delivery costs”. I was like, “what the heck, it’s not that expensive and if I don’t like it I can probably sell it off easily as they are not for sale in Europe”. So he ordered, got them delivered at the home of a friend living in Seattle, and before 3PM CET (while the USA was still kind of waking up) the order was already processed and two bands were on their way from California to Seattle. This quick decisive action turned out a be a very good idea indeed, as you all probably know what happened when the USA did wake up. Bands sold out faster than turkeys on Thanksgiving and back orders now stretch up until Christmas. MVPs arriving in Seattle mostly ran into sold-out stores. It must have been a pretty frustrating experience both for them and the ever friendly and helpful Store staff. But my Band was already delivered and waiting for me in Seattle a few hours before I actually got up to leave for the airport. and initially I thought it was pretty OK. At the very least, I could bug all the American MVPs who thought they could buy one in the Bellevue store which – of course – was cleaned out empty. After a few days, I noticed substantial changes in my behavioral patterns. Some week later, after I already was back home again, I found it was now an indispensible device. Why? One word – notifications. I was no longer attached to my phone. I even turned off my phone’s ringer and notification sounds. For a very simple reason. Consider someone like me, who is online a lot and has a Windows Phone. I get a notification. I pick up the phone. I look at the notification. But then I see all these other things on the screen. Which is the whole idea of Windows Phone – to be ‘glanceable’. But I tend get distracted by all these interesting things. So I go and answer this tweet, that Facebook post – and before I know 15 minutes have passed by, my wife – with whom I was on an the typical on-and-off talk when we both arrive home a bit tired from work, is now reading a book, whatever. Without noticing, I had become a more sociable creature, and more efficient too. The Band has become my gate keeper. Going into social media and mail is now a conscious decision. I have to get up and find my phone, for instance. Yet I don’t have to shut off my phone anymore to reach that state. I have found a kind of middle ground. The calendar is synced to the Band as well, so even when I walk out of the house without my phone to do some quick shopping (I never forgot my phone before, but now I do) I still get calendar reminders. It has Cortana integration, so I can actually say “Remind me to take the pizza out of the oven in 30 minutes” to my Band using the action button, and it will remind me in 30 minutes. That will need connection to my phone at the moment I actually take the reminder, but I don’t need to get my phone first. And then I can get out of range and it will still remind me. The other day I was in bed, my wife was out, and my phone was lying around downstairs. I was very tired, and decided to tell my wife I went shut-eye. I found out I could actually say to my band “Text my wife I am going to sleep now” and sure enough, my phone, one floor down (and we have 40cm – well over a foot - concrete floors here) picked up the command. And it sent back response to my Band a minute later, too: “will be home in 15 minutes”. You can read online of course about all the that the Band does. It actually does quite a lot. Apart from notifications, alarms and the Cortana commands, it tracks hearth rate, steps, and calorie burn, you can use it as a fitness coach, track running (it has its own GPS so you don’t have to lug around your phone), and you can use it to check UV levels. I am not even sure I have the complete list covered now. I can tell you it felt a bit odd noticing that, when the cabin attendants told us to put all devices in airplane mode before taking off from Seattle, there is actually an airplane mode on the Band. In 2014, my freaking watch actually has airplane mode and takes voice commands. Welcome in the future. I really think the UV meter is a really nice and smart touch in these days when we learn more and more about sun burn and skin cancer correlations. It basically takes a sample, and says how much minutes current sustained will typically get you a sunburn. As there has not been very much sun both in Seattle and here since I got the device, I only got “low” the few times the sun actually was out. Some people, like Paul Thurrott, call it “Microsoft’s moonshot” meaning that Microsoft could not decide what should and should not go into it’s first wearable, so they put in everything and the kitchen sink, making the device complex and hard to operate. I personally think the day-to-day operation of the device is very easy (the tile interface is very simple and natural, especially for someone who has seen Windows Phone or Windows 8 applications) and there are only two buttons. How hard can it be. I think by putting all this stuff into one little device they actually made it something for everyone. My wife wants one too – not for all the gizmo’s I like, but for the fitness/sleep stuff. Finally – what the designers probably never thought of as actual usage – it makes for an excellent night light in the dark. When you press the big button in the middle – even in sleep mode the screen gives off enough light to see a little by in the pitch dark. And since you are wearing it, you don’t have to find it first. Very useful when you are staying in a strange house or hotel and want to find the toilet without waking everyone up in the middle of the night by turning on the light (or crashing down the stairs – something I narrowly avoided last year). Apart from a different usage pattern for my phone, making me more sociable and efficient, it also has had an impact on my sleep pattern. I like the sleep tracker, but I don’t like what it’s telling me – I sleep too little. I thought I was getting 8 hours per night – it was more like a little over 6. I should rest more, and I do – it’s now close to 7 hours per night and already feel better. I also feel I will need to do more exercise, as the steps tracker has a default goal of 5000 steps and I get to that usually only half the time. In general, it makes me conscious about a lot of things I did not really know about. As the Band is now more or less functioning as a remote for my phone that is ‘somewhere’, I would much like a simple app or function to control the music player. Skip forward one track, skip back one track would be much appreciated. Skip forward 60 seconds, skip back 30 seconds would be an awesome bonus for listening to podcasts (and skipping ads). I can do that with Cortana to an extent, but it does not always work, especially when the phone is streaming music over Bluetooth and thus that channel is already very busy. I would like to be able to see a 2nd time on ‘Watch mode’. There’s room enough on the screen for that. As someone dealing a lot with people from another time zone (i.e. PST) that would be convenient. The UV meter needs to take into account skin type, or just stick to saying the level. Apart from the level, it now says “typical times to sunburn nn minutes” but how does one define typical? Someone from African heritage can walk for hours in a sunshine that will burn a red-haired descendant from Irish stock into (blistering) misery in 15 minutes. That even varies over the year – while the first fierce spring sun can give bleached-out-me a sunburn, my skin darkens fairly quickly in the sun and the same level of sun power won’t bite me just a month later. I wonder if it would be possible to have the app take a picture of facial skin, analyze that and calibrate the sunburn time from that. The design worries me a little. I find it pretty cool looking and comfortable to wear. It’s light and does not get in the way when I am working on a keyboard, which I found puzzling as my normal watch is too constrictive for wearing while typing. The Band is just a little bit flexible, light and does not get in the way. I also am a fussy sleeper (the most stupid things keep me awake), but I have no troubles sleeping with it. And yet - I have also noticed over the years that the rest of humanity does not necessarily agree with me on what is good looking and what is not. It only comes in black. I wonder how fashionists will think about it. I understand why the companion app works and looks like it does. The New Microsoft went all-platform in the typical new way, which is very commendable and probably has contributed to the device selling out so fast. 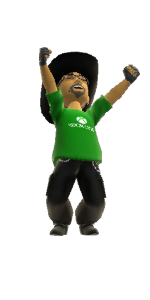 That does not help that on a Windows Phone it looks odd and alien. The awesome, well-designed and natural feeling UI of the Band itself is a stark contrast with the clunky UI of the companion app. For a first launch into the wearables, Microsoft have done a tremendous job at a pretty compelling price. Even with expensive NDD I ended up a little north of €180 (yay Euro!). People routinely spend that on watches that look like they come out of the dashboard of the Titanic bridge - and those only display time. Going cross platform with it from the get go and making it available the next day – full marks. The first batch sold out in a day, the second – this week – lasted about 10 minutes. Consumer demand says it all. I find the device an invaluable companion device to my phone. Especially since I use a 1520, which is pretty big – I don’t pull it out half as much anymore these days. It’s the first gadget I bought that my wife is very explicitly happy about, because I am less distracted. She wants to have one too – that is going to be a bit of a challenge I think. I am also very happy with it, to the extent that I would to get another one ASAP if this one would break down. In the mean time, I just have to be careful. I am not a professional reviewer. This is just my experience with this one device, after about 3 weeks. As I have no comparison material, I also cannot tell if this device is better than comparable devices. I just felt the need to write it from a tech user’s perspective. On October 18th the Dutch and Belgian Windows Platform Development communities got together for an event called “Lowlands WPdev 2014”- yours truly was one of the conference organizers, and gave a talk about geofencing. This blog post is basically a partial write-down, just explaining the code and how to test it. 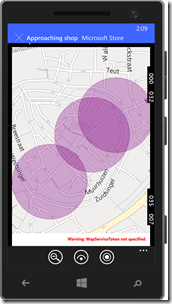 It shows the created geofences on the map. 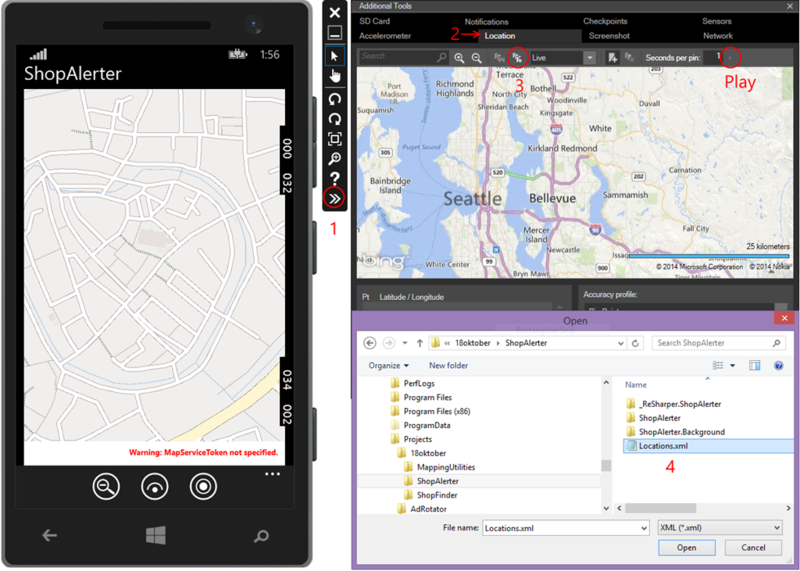 On Windows Phone, we use Here Maps, on Windows we use Bing Maps. As both banners show, you should get a key for both map platforms to get you app certified. 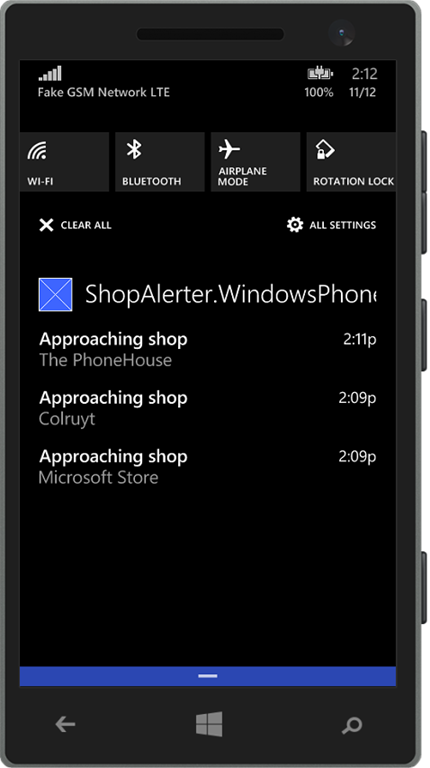 As the enters a geofence, a trigger is fired to show you are approaching a shop and a toast message is being displayed. That is – in theory. In practice stuff is not so easy, especially in Windows. The project consists out of what nowadays is a pretty standard Universal App structure, with a Windows, Windows Phone and a Shared Project. In the shared project is the App.xaml and a partial class MainPage.cs, basically holding some of the code behind stuff that normally goes into MainPage.xaml.cs. But we want to share as much code as possible – and we can. The Mapping.Utilities.Pcl contains helper methods to visualize geofences on the map – described in an earlier article about visualizing geofences. 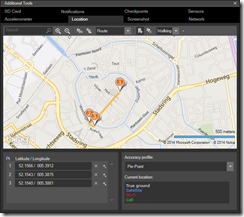 The MappingUtilities.Windows contains one helper class to convert to the common Geopoint type to the specific Location and LocationCollection types used by Bing Maps. 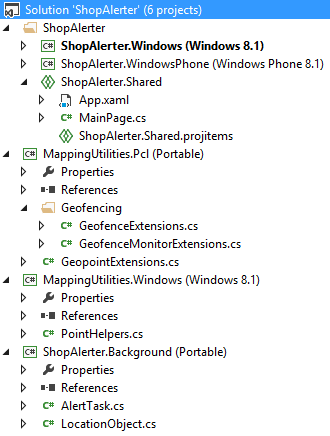 Finally, the ShopAlerter.Background is a so-called Windows Runtime Component. Background tasks need to be defined specifically in such a component. I am not entirely sure why, but that’s the way it is. This is the power of the Universal App. All the rest is either in the shared project or the Windows Runtime Component that is also used both on Windows and Windows Phone. What you basically see is the OnNavigatedTo method that clears the geofences, and sets the zoom level and center point of the map. The other two methods are just used for drawing circles on the map and removing them – also showed in the same article I wrote earlier in my article about visualizing geofences. So what's in this famous shared project then, huh? Well, just the partial class MainPage.cs. 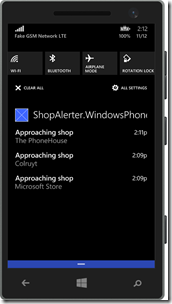 This adds methods to both the Windows and the Windows Phone MainPage.xaml.cs. The key thing is to understand code is shared, not binaries. Every line is compiled twice, both into the Windows and the Windows Phone project. Unlike Portable Class Libraries or Windows Runtime Components, which are shared binary. So. The method called by pressing the middle button adds (and shows) or removes the geofences. This is a simple toggle function like this. The key thing about geofences is that they, well, have a key as well as a location. So if you add a geofence, you should first check if a geofence with the given key is already present. If it is, delete it first before adding one with the same key. 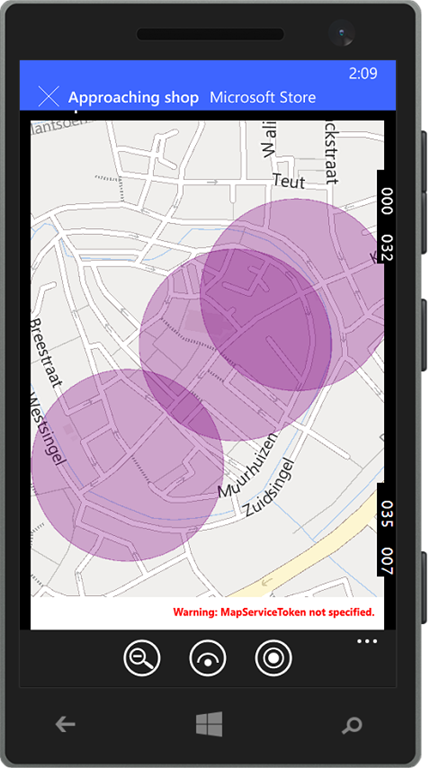 Then I create the shape for the geofence. Currently, only circles are supported so I create a circle with 150 meters in diameter. 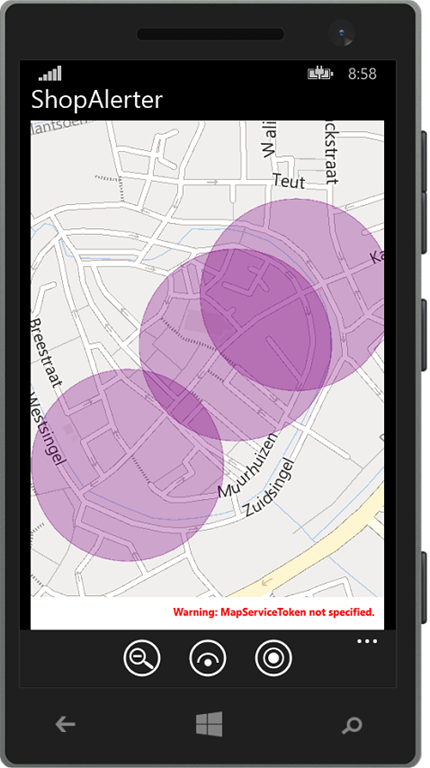 Then I define the geofence should be used multiple times – setting singleUse to true will make it disappear from the GeofenceMonitor automatically after it has been triggered. 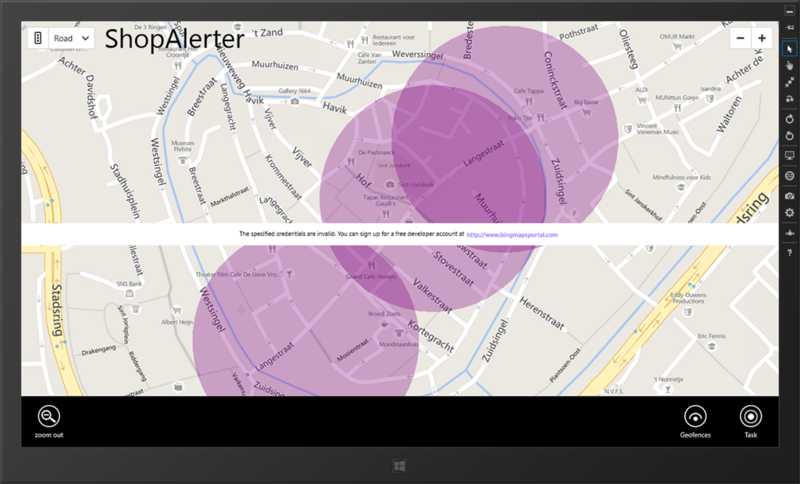 The mask will determine to what events the GeofenceMonitor will respond on this particular geofence. You can choose between Entered, Exited, Removed and None – to respond to multiple events, just OR ( +| ) to the mask like I show in the code. For the last step I use a LocationObject helper method. That is kind of my ‘data base’, which I will show later. Having retrieved the object, I can show it’s name in a toast. A simple helper method, that I kinda stole from Rajen as well. My only improvement is the Debug.WriteLine at the end, which we unfortunately will need badly further down the road. The methods to query the background task’s state, to register and unregister is are also based upon Rajen’s sample, only I have made the Register task actually awaitable. That’s a real live application of the trick I blogged about yesterday. In the RegisterInternal method I simply make a fairly standard background task, only it’s now triggered by a LocationTrigger. 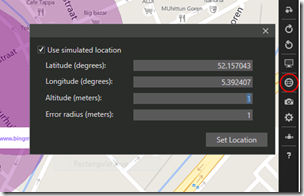 The odd thing is, the only parameter you can – and must – supply to the LocationTrigger’s constructor is a LocationTriggerType enum, and that only has one value – Geofence. I assume the API designers originally planned to implement more options here but in it’s current state it’s looking a bit strange. But anyway, it works, that’s the important part. If now anyone enters or exits a geofence, the Run method will be called. This is not very interesting, but only showed here for the sake of completeness. It’s basically an object with an ID and a location (which I need for creating a geofence) and a name to display. Two static helper methods help me to create a list of fake hard coded objects, or retrieve one by ID. 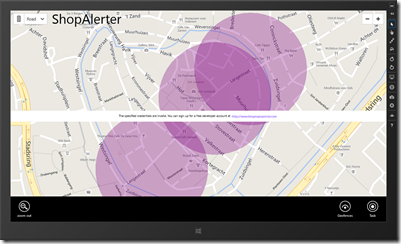 The area is real – it’s the main shopping street of my home town Amersfoort – but the data is completely fake. There is, unfortunately, no Microsoft store on this continent, let alone in Amersfoort. 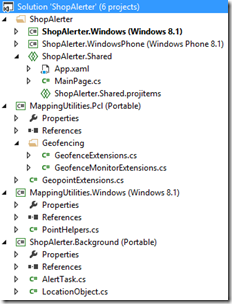 Find the file “Locations.xml” that comes with the demo solution (it is in the project root) and select it. Note I also marked the play button – we will need that later. After you have loaded the xml file, zoom in about five times (press the zoom in button) and you should see about as displayed on the right. Press the middle button on the application bar (the one that is labeled “Geofences”). The geofences should appear as semi translucent circles as displayed in the very first image on top of this post. Now if you have done everything right, pretty soon you should see the first toast pop up, and they should appear in the notification center as well. Since the phone should move on walking speed (it’s a pedestrian area) you might need to wait for a while for them all to appear. Awesome. Now it’s time to have a look at the Windows project. That is all. I love the Universal App model. 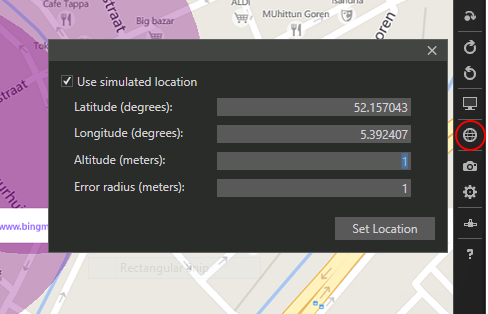 All I need are methods to set the initial zoom level and location of the map, and methods to draw and delete geofence geometries. The rest is shared code in some way or the other. You can see here Bing Maps uses the concept of layers. That’s about the only thing Bing Maps handles better than Here Maps IMHO – the z-index of map objects is handled by a layer object rather than on a per-object basis. This makes certain display manipulations a lot easier and faster. The real pain, though, is in testing this. The Simulator does not support a notion of route – only of location. You can basically appear on one location and then on another, but not make it smoothly move from a to b, like the Windows Phone simulator. But that is the least of our worries. The Windows simulator does not display toast notifications. This apparently has something to do with the simulator being a kind-of-copy of your actual PC, with all your apps installed. The Windows simulator does not allow the registration of background tasks. Try it. You will simply get an exception saying “This request not supported”. You can unregister, but not register. I have no idea why. 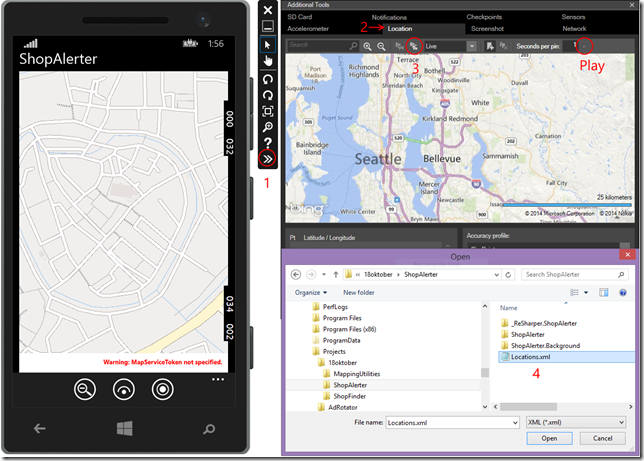 Run the app from Visual Studio on your local machine first. Make sure the “Debug Location” toolbar is visible. If it’s not: click View/Toolbars and check “Debug Location”. You will need to do this step only once. The task is now registered. Now stop the application (just from Visual Studio). 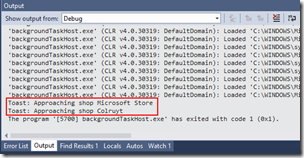 Deploy and run the app from Visual Studio on the simulator. Remember I wrote about this being a kind of copy of your PC? Guess what, your app is already there, including the background task. Hit the “Geofence” application bar button. 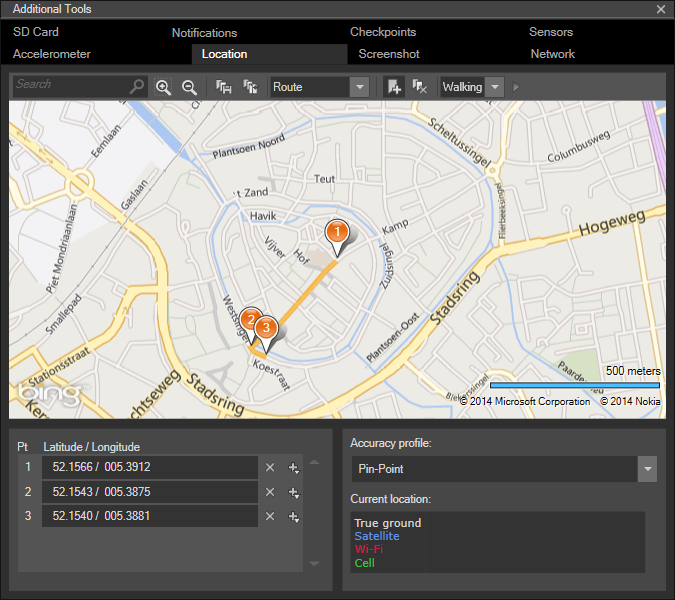 You will now see the geofences. You will now have to set the location of the simulator. There’s a button for that on the right hand side of it’s window. 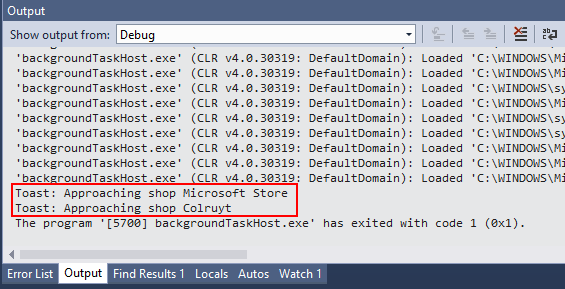 I picked the location of the ‘Microsoft Store’ as location. Still nothing seems to happen. But if you mosey back to Visual Studio and have a look at your output window…. Lo and behold – the result of the Debug.WriteLine. The toast code has fired, the geofence therefore has been activated, thus our code works. To make this app work at all, you will need to set some capabilities. For both apps, you will need the “Location” capabilities, and both applications needs to be Toast capable. For the Windows application, you will need to set a Badge logo. To save battery and to prevent you app from hogging the processor, LocationTriggers will only fire once every 2 minutes – at most, at least on the phone. So this technique is not very suitable for high-precision, high-speed tracking. Geofence events will “coalesce”, as it is so beautifully called – meaning they happen about every two minutes all at the same time. The Windows Simulator – to put it very mildly – is not quite on par with the Windows Phone emulator. Particularly the situation around location simulation, background tasks and notifications could benefit significantly from quite some attention. I sincerely hope this will be addressed in some future release – preferably the very next one. A very short tip this time, that took me some time to find out. in your Windows RT component, it won’t even compile. But there is a solution – you can return an IAsyncOperation<T>, and that is awaitable too. And we’re done. This will compile, and you can now call “await myObject.PublicMethod()” from outside the Windows Runtime Component.